Oh. My. Goodness. I finally finished this book. There was a certain kind of torture getting through it. For some reason, I was so excited for this book to come out. I kept thinking that it was going to be so good. I think I romanticize things as time passes, which is why I am writing this review right now. I just finished this book, this last book in this series. 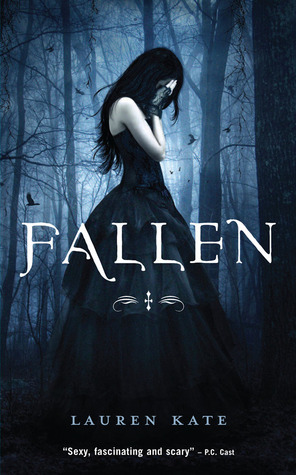 Fallen — read it quickly, wanted to know what the heck was going on. Was mega pissed at the end, and left with a queasy feeling. Not sure what that was from…but I still get it when I think of it. I just wasn’t satisfied. Now that I have finished this series, I might recommend this book to someone who loves YA fiction about angels, but then again I might not for the same reason. Work that one out for yourself. 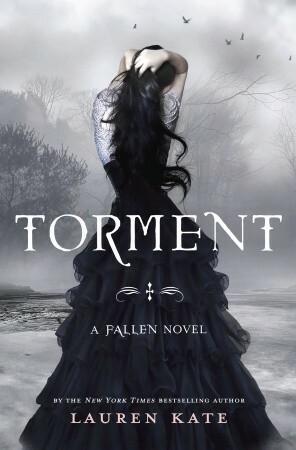 Torment — the whole setting changed, a new group of main characters were introduced, and it took me awhile to acclimate. I was drawn in by the shadows, and wanted to know more. But the book still bothered me. I ignored it, and read it pretty quickly. So I had to acclimate to the book almost like it was a totally different story, but then things started happening that forced me back into the Fallen world, and it was just awkward. Also, the married teacher angels were weird. How come they can choose sides and still be married…and yet….well……I’ll just stop right there. No spoilers for you!!!! 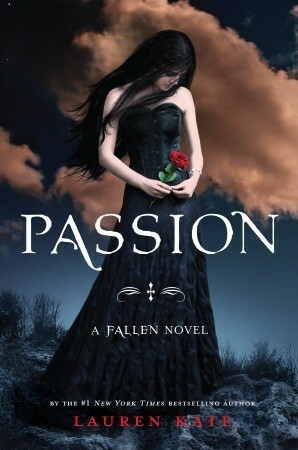 Passion — I love history and time-travel, so this book was great. Of course, the gargoyle thing was weird, especially now that I know what I know…..and the ending was just bizarre. It didn’t make sense. I think that is why I was looking forward to Rapture so much. I wanted answers, and a good ending. This story was cool, I liked how she went back through different lives. But it also got pretty old pretty fast. It was so different, though, and I think that threw a lot of people off who did like this series thus far. I was under the impression that this would be the conclusion, until I got to the end. I was all like, oh…not a trilogy!?!?!?! $%$@^# So yay…I get to wait a year for the next book. Double yay. 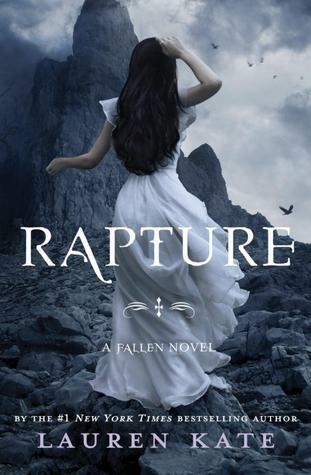 Rapture — Well I’m really hoping the high rating for this book on goodreads.com (rating is 4.14! what what??) was from all the anticipation….because it was not a good book. Getting through it was some sort of marathon…a marathon through hell or something. A gauntlet through torturous sharp things. Not awesome at all. The whole book just had me laughing in disgust. It was stupid. So stupid. I can’t even stop thinking of the word stupid. There’s no better word to describe it. The writing was rushed and ideas were not complete. I could see what was coming (although there were some surprises…that got the book the extra star) and the characters were so lame. As they had been. And incredibly self-centered. There were some good ideas in there, but basically, it just blew. Every time I would start to get into the story, something would be so blatantly dumb that I had to stop reading to keep from throwing my ipad across the room. I wondered at times if reading it in physical book form would have helped at all? At least I didn’t ruin an expensive piece of equipment. Or something like that. Bright side? I kind of feel like it is a better and worse copy of Twilight all at once. Even though the stories aren’t really the same….the main characters were blatantly annoying (also he glows…purple…so there’s that) I don’t know any real person like these characters, and I’m not sure I would want to if they exist. All of the characters were cliche and the dialogue didn’t flow and had me distracted throughout the entire book. I felt like this was the worst book of the four, and left me with a nasty taste in my mouth and a frown on my face. Bummer. So yeah…I wouldn’t recommend this unless you feel like being tortured because you just have to finish this damn series. Would I recommend: Read at your own risk. And don’t buy them. Waste of paper and more paper.